far easier to achieve success with! I’ve been wanting to make some fudge for a while now for small Christmas gifts. Being quite a traditional sort of person I was planning on making it the classic way, in a heavy pan with a sugar thermometer whilst watching it like a hawk. But, after three failed attempts, yes three (! ), I was starting to become a little frustrated with it. Either I didn’t achieve the correct firmness, despite using a sugar thermometer, or the pan ended up with a thick layer of burnt sugar on the base! Thankfully after a lot of elbow grease and soaking said pan is now back in regular use! 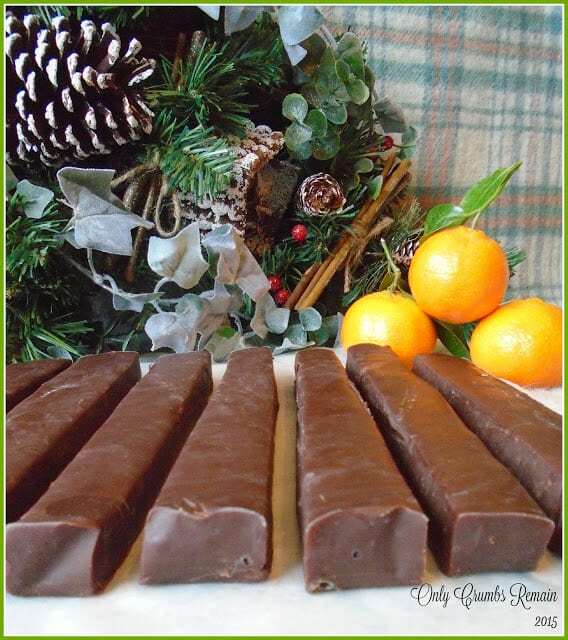 Being the sort of person not to give up I have written to Santa to ask for a new digital thermometer, so later in the new year I will be aiming to successfully make some traditional fudge, fingers crossed! In the meantime though, and still wanting to make some homemade fudge gifts, I by chance came across a method of making fudge in the microwave! I must admit I was a little sceptical at first, after all, heating chocolate and sugar in a microwave just didn’t seem to sit right in my mind. Sugar and chocolate are so sensitive to heat that they can easily burn (don’t I just know it!) and the chocolate seize. However, having seen a few references on the internet describing this method, I decided there must be some method to the apparent madness 🙂 and decided to give it a try! And you know what, it worked a treat! There was no need for a sugar thermometer. No need for a quality pan either. Just a microwave, a suitable container and 10 minutes! I used two types of chocolate in the mixture, milk and plain. I believe the plain chocolate helps this type of fudge to firm up a little more given its higher proportion of cocoa solids, but given that I’m not a massive fan of plain chocolate I introduced some milk chocolate to the mixture as well. The combination was delicious, still being sweet and delivering a good hit of chocolatey-ness. Not wanting to go off piste with the flavours I added some orange extract to the hot fudge mixture to create a classic flavour combo. 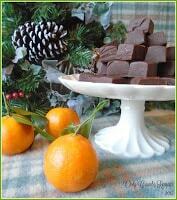 If you enjoy Terry’s Chocolate Orange, you’re certainly going to love this fudge! It’s citrusy, rich, silky, sweet and indulgent! Very indulgent! The fudge was shared amongst neighbours, friends and Mr E’s work colleagues who loved it, many of them asking for the recipe! The fudge is oh so perfect to parcel up as small sweet gifts this Christmas time. Being a lover of baking, I just love to make small edible gifts at this time of year. Parcelled in cute cellophane bags and tied with a festive ribbon, it’s lovely to share a few of these delicious pieces of confectionary with friends, family, work colleagues and neighbours. This quantity easily filled 8 small cellophane bags (6 pieces each) leaving Mr E & I a few left over to graze upon. Alternatively, why not pile them high on a pretty plate for those mingling Christmas and New Year celebrations. Time: hands on time about 10 – 15 minutes; plus cooling and setting time. 1. Prepare the Brownie Tray. Using the extra butter grease the base and sides of the brownie tray. Fully line with grease proof paper, ensuring there is excess paper around the sides to aid the removal once set. 2. Place the ingredients in the microwavable container. Pour the condensed milk into the container. Using a sharp knife or scissors, break up the chocolate and add to the container (do not stir). Cube the butter into the container, again do not stir. Place the lid onto the container. 3. Microwave the ingredients. Place the container in the microwave and cook on full power for 1 minute. Remove from the microwave and stir. 4. Continue heating in the microwave. Return the container with its lid to the microwave and cook for a further minute. Stir again. Repeat twice more. The fudge will now have had 4 minutes in the microwave. 5. Reduce the cooking period. As the chocolate and sugar is becoming hotter it’s arguably wise to check the mixture more frequently to avoid burning. Return the container with its lid attached to the microwave for 30 second increments, stirring well after each period. 6. Watch for the bubbles. After 5 to 6 minutes of cooking you will notice that the mixture is starting to bubble around the edges of the container. At this point cook the fudge in the microwave for two more 30 second periods, stirring well between each. 7. Cool. Remove the container from the microwave and stir well. You will notice a thin layer of melted butter on the surface of the fudge. As the mixture cools and it is stirred further this will easily be combined in the mixture. Set aside for 5 – 10 minutes to cool slightly. 8. Add the extract. Once the fudge mixture has cooled slightly, add the orange extract. Stir it in thoroughly. The mixture should be thick and silky at this stage, and the melted butter should be incorporated following the thorough mixing. 9. Allow to firm up. Carefully pour the fudge into the prepared brownie tray (remember, it will still be very hot). Use the back of a metal spoon to coax it into the corners and level the top. Set aside to cool. Once cool enough, cover with cling film and place into the fridge place into the fridge for a couple of hours, or over night, to firm up. 10. Slice. Remove from the fridge and use a sharp knife to slice into pieces, I managed to slice 60 cubes. a. Remember the fudge is very hot once it has been in the microwave for a few minutes so avoid licking the spoon! b. Due to the different powers of microwaves, some will take longer than others to reach the ‘bubble stage’ (step 6 above) . Ours took 6 minutes. c. During the last two 30 second cooking periods be aware that the fudge will rise and may risk knocking off the lid. Be vigilant, and if it looks as though the lid may become displaced stop the microwave immediately, remove the container, stir the mixture thoroughly and then return it with the lid for the remaining cooking time. 🙂 Like not liking the spoon 😉 it's something I'm likely to do and given how hot the fudge is, it's worth mentioning how unwise it would be 🙂 It was really delicious – very rich obviously given all of the chocolate and condensed milk – but they really went down a treat. It's so frustrating when it doesn't work isn't it…I'm determined to master the traditional method though! I hope you enjoy it as much as we did if you get chance to try it. I love microwave fudge! In fact I made some chocolate reindeer malteser fudge last week! Thanks for entering this week's festive food friday! Ooh, chocolate reindeer malteser fudge! Sounds good! I'm totally sold on microwave fudge, I can't get over how easy it is! I was dubious too Mumjd, but it really did work. I'd certainly recommend stirring the mixture frequently though as I've suggested in the method, and keep a look out for the bubbles around the edge. I'd imagine (though I may well be wrong) that because the chocolate is being melted into something (ie the condensed milk)it's structure is some how altered and is therefore less likely to seize and spoil. Do let me know how you get on if you give it a go. I was intrigued to see if you'd used actual chocolate orange or regular chocolate and orange extract. I attempted some baking with a chocolate orange the other day and it was a disaster, it seized very quickly and ended up in the bin – what a waste. This fudge sounds so yummy – we love chocolate orange in my house so this would go down very well. It really was yummy – very rich so one or two pieces was sufficient at any one time. 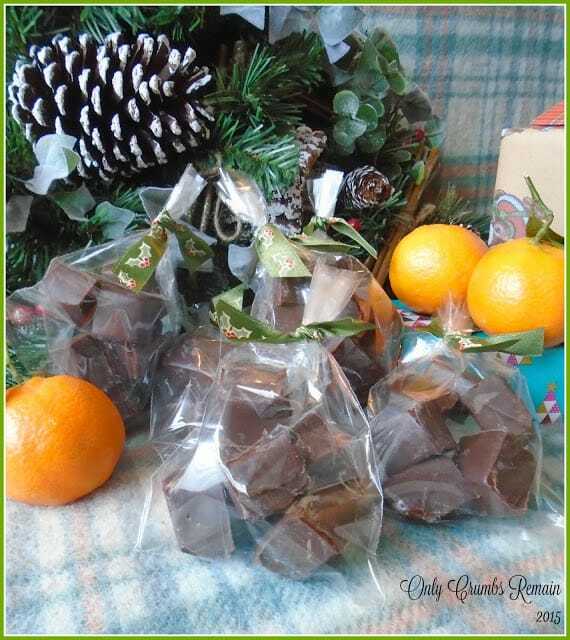 I had considered using chocolate Orange for this fudge, but I decided to use regular chocolate with separate extract so I could add as much of the flavour as I wanted. I was really pleased with how well the orange flavour came through. Hope you enjoy it Martin 🙂 Do tweet me an image if you get chance. Started off by slicing off my fingernail while chopping the chocolate, then thought I'd burnt it, then did EXACTLY what you told me not to and licked the spoon (I knew I would! )… but the fudge is excellent! I thought it was too soft at first, but fresh from the fridge it's fantastic! Just need to make another batch as this lot didn't last past the weekend, let alone Christmas Day!! It's delicious isn't it, it does have a nice firmness straight from the fridge but I find the orange flavour is more noticeable when it's not quite as cold.